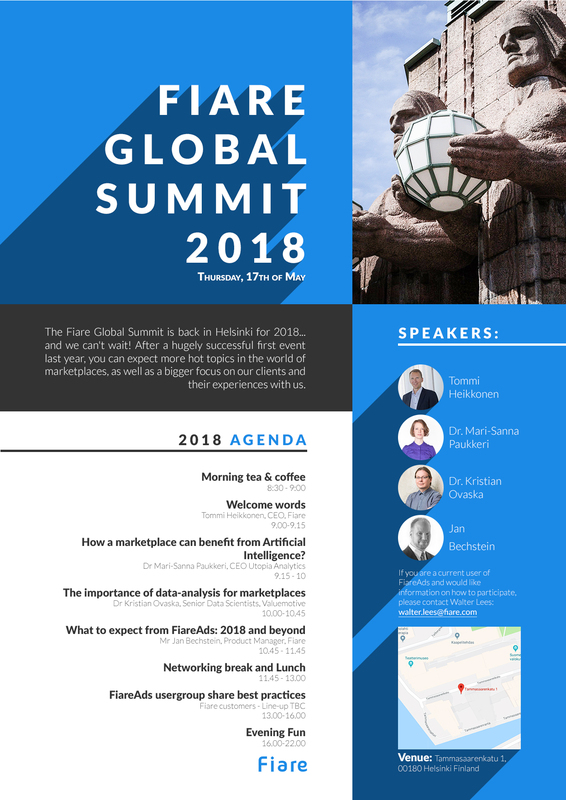 After a hugely successful inauguration in 2017, the Fiare Global Summit is back. This year’s conference will take place on Thursday 17th May, 2018 in Helsinki. The sessions are on hot topics for marketplaces including AI and other innovative technologies which will affect experiences and content consumption. Data analysis specific to marketplaces will be explored. There will also be discussion groups so that our clients and other guests can exchange ideas, best practices and key insights from marketplaces in their different sectors. Guests last year came from various corners of our client base – Time Inc. UK, Springer Nature, Otava Media Group, AvBuyer and more. We are confident that this year will be bigger and better. The event is free of charge for clients. For other guests, there are limited spaces available. To enquire about attending, please contact Walter Lees at firstname.lastname@fiare.com. For a round-up of the action in 2017 click here. You can find the agenda below. Please note that these are subject to change. To be kept up-to-date with all Fiare correspondence on events and more – please email media@fiare.com.